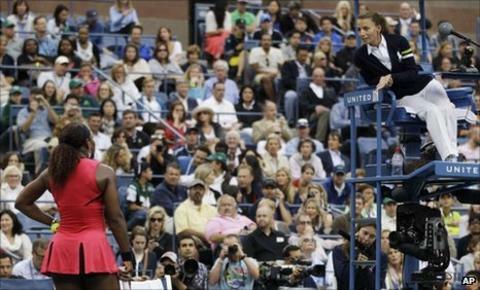 Serena Williams has been fined $2,000 (£1,265) but avoided a Grand Slam ban for her tirade at umpire Eva Asderaki in the US Open final. Sam Stosur won the match 6-2 6-3 after Williams was given a code violation. Williams was on a two-year probation for a similar outburst in 2009. The incident occurred when the American looked to have saved a break point, but her cry of "Come on!" was judged to have come before Stosur had a chance to get the ball back. "If you ever see me walking down the hall look the other way. You're out of control, you're a hater and you're unattractive inside." "Who would do such a thing? And I never complain. Wow. What a loser." "You get a code violation because I express my end, we're in America the last time I checked." "Can I have a water? Or am I going to get violated for drinking a water? Really don't even look at me." The point - and the game, the first of the second set - subsequently went to the Australian for "intentional hindrance" and a furious Williams aimed an angry tirade at Greek official Asderaki. Williams, 29, who received a cheque for $1.4m (£885,000) for coming runner-up at Flushing Meadows, was consequently given a code violation. At the end of the game she continued to berate the umpire, saying "You're out of control. You're a hater, and you're just unattractive inside." US Tennis Association (USTA) tournament director Brian Earley fined Williams $2,000 and Grand Slam committee director Bill Babcock agreed with the penalty after reviewing the incident. "The Grand Slam committee director has determined that Ms Williams' conduct, while verbally abusive, does not rise to the level of a major offence under the Grand Slam code of conduct," said a USTA statement. Asked about her reaction after the match, Williams said: "I don't even remember what I said, it was just so intense out there. "It's the final for me, and I was just - I have to go - I guess I'll see it on YouTube. I don't know. I was just in the zone. I think everyone, when they play, they kind of zone out kinda thing. I don't know, I'll see it later, I'm sure." She added: "We live for these moments, you know. Everyone lives to be, you know, in the final of Wimbledon or the final at the US Open. Whatever happens in that moment, you live for them and we breathe for them, and hopefully I'll be back for them." Stosur, 27, admitted that she had been surprised by the incident, saying: "I didn't really know what was going on. I was just there. I know about the rule but I have never had to deal with it before." Three-time champion Williams earned $900,000 (£567,000) for reaching the US Open final, plus a $500,000 (£315,000) bonus for finishing first in the standings of the US Open Series, which takes into account results at hard-court tournaments. Williams was fined £53,000 and put on a probationary period at the four major championships in 2010 and 2011 after verbally abusing an official over a foot-fault call in her semi-final defeat by Kim Clijsters at the 2009 US Open.